The 1933 Portland Public Market building was demolished in 1969 to make way for an extension of SW Harbor Drive. This view is south from the end of Morrison Street; the building stretched three blocks, ending where Salmon Street Springs is now. 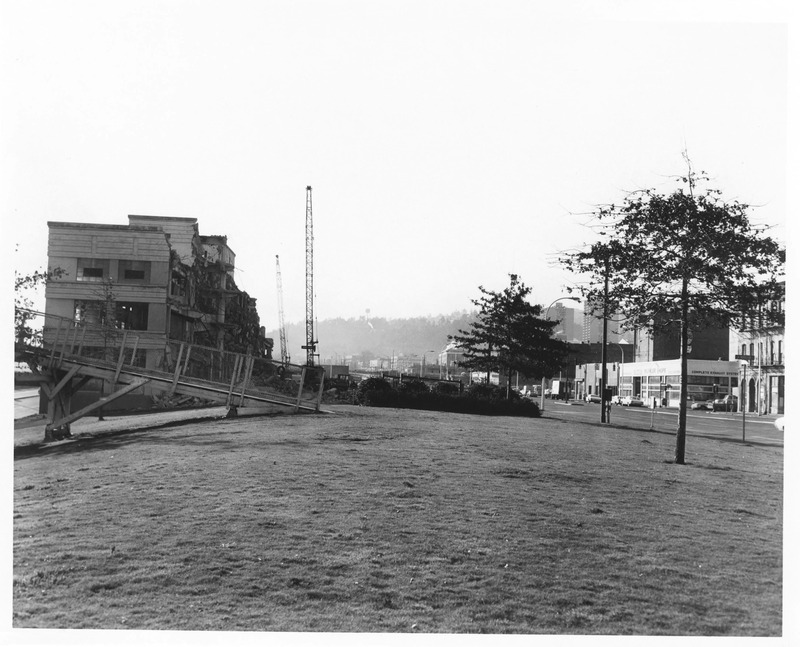 Not too many years later Harbor Drive itself was removed for Tom McCall Waterfront Park. Even tho it sat mostly empty after the Oregon Journal folded, I was sad to see it get torn down. At the time that building seemed dated, yet it was only 36 years old. That was an impressive structure to have been built in the middle of the great depression. I imagine if it had been saved and a public market put there, we would have had quite a signature building for our city. So I’m confused… I thought the Harbor Drive fwy was built in 48? Exactly how/where was it ‘extended’? I can’t really answer that, Tad. I know the building was torn down the same time that 405 was being built so perhaps it was tied into that. As far back as I can remember Harbor Drive it was pretty much the same throughout the years it was in existence. A few minor points: The Oregon Journal moved out in 1961 but remained an afternoon daily for another 20 years until 1982. As for the issue of expanding Harbor Drive, JayinPortland’s link is right, the plan was to widen Harbor Drive which required the removal of the Public Market building. Also, note the railing in the center of the photo slightly to the right of the pedestrian bridge over Harbor Drive. I’m pretty sure that was around the stairs to the pedestrian tunnel under Front. 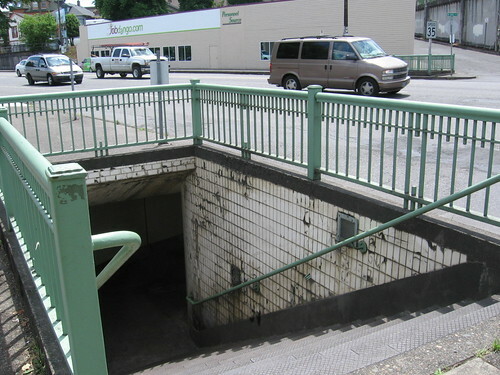 I have a distant, but clear, memory of using that underpass as a pretty young child in the mid – late 70’s. It had some kind of ceramic tile walls I as I recall. Not sure when it was closed off. Anyone else remember that? Anyway I had reasons to guess it was at Front and Morrison and had hoped to find a photo to confirm it, so thanks for this great photo! Brian – I also have a vague recollection of the tunnel under Front. As I recall, it was on the south side of Morrison, just outside what was then the Riverside West Motel. I used to pick various bridges to walk across on my way downtown. Burnside and Morrison were 2 of my favorites because of the view of the skyline. I remember that tiled tunnel. But I can’t remember exactly where it was located. I think your location is correct, Dan. If I remember correctly I think it went under Front Avenue. Here’s a photo of another pedestrian tunnel under SW Kelly at SW Arthur that looks just like what I remember at Morrison. Wow, seeing that white tile that stuck in my mind from childhood for the first time in over 30 years was like stepping back in time! I note the style of the railing is exactly the same as in the photo above so I assume there were probably several of this style tunnel built around the same time. Oh and thanks Dan for the great website — can’t tell you how cool it is to have so many of these old photos of Portland online. Absolutely love it! Yes, Dan, it’s a great site. Thanks from me, too. There were similar ‘subways’ at the intersection of NE Boradway & N. Williams Avenue. They went under Broadway. I remember they smelled of urine.